Invite others and spread the word! Join us in honoring a great friend/family/all-around guy with food, booze, photos, sketches, song requests, memories, your best friends, and anything else that reminds you of Devin! We’ll have an available kitchen and numerous cooking supplies. Amber Marsh and I (Abra Adduci) are working on a makeshift “campfire” for telling stories (and toasting marshmallows, obviously). Devin was quite the gourmand and food and drinks connected to memories would be ideal! I’ll post a slew of suggestions…add to it! Sedgwick Studio is down the block from Devin’s childhood home; feel free to arrive early to check out his favorite “haunts.” Plus, the best pre-party action happens over a bottle of wine in the kitchen! Because Devin had a lot of friends and family across the country, we’re urging people outside Chicago to gather together, share memories, and join us in a simultaneous toast. In the spirit of Devin’s lifelong willingness to lend a hand, any help – from manpower to supplies and equipment – is *greatly* appreciated! 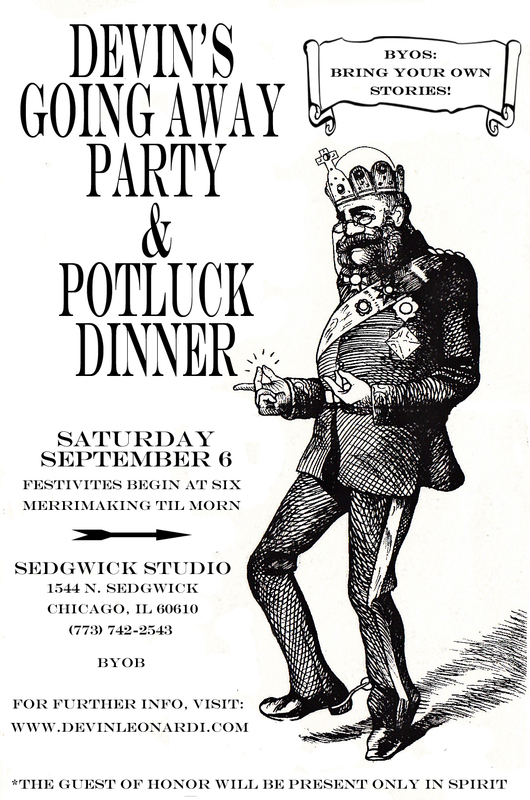 Note: The drawing on the invite is by Devin, originally from an old party flier…and now reborn!